Are all Washington State District elections for the 47 Washington Conservation districts full of fraud? These are the districts, mostly bound by county lines that “help citizens protect renewable resources through the use of voluntary, incentive based practices” in mostly all WA counties. They are federally, state, and grant run and funded. In this state, for each district, there are three elected citizens who act in supervisory positions. The one rule is that they be landowners who manage a farm. Because they are elected positions, any registered county voter may vote for their election. Start with Whatcom: If Whatcom Registered voters do not know about an election they may vote in, if the facts about the election are hidden on a back page of one local paper, if voters request a ballot and their request is not recorded and they are not sent a ballot, even though they were told they would be, is this fraud? You answer that. The facts follow. Recently: The Washington State Conservation Commission (SCC) finally certified the results of the March 10 election for the Whatcom Conservation District board after finally opening and counting the 228 contested ballots. Reputedly — ballots were all certified when voter intent was clear, claimed Bill Eller, a SCC lawyer whose supervisor Mark Clark, the Executive Director of SCC, had overseeing the 2015 election results of the Whatcom Conservation District (WCD). Mr. Clark had Mr. Eller working on verifying election results because so many citizens had written complaints to the Commission. Mr. Eller did not think it mattered that some registered voters may not have received a ballot. He assumed this was only a tiny amount. Nor did he think it mattered that the voter requests were not recorded, as it was not legally necessary. Final tally of 2015: The final vote tally, certified by the commission on July 16: Helm, the Tea Party candidate, won with 2142 votes — 46 more than Monjure, the progressive, with 2,096. That was an unusually large quantity of voters for any WCD election. Explanation: In 2012, Whatcom Watch, let their 6,000 estimated readers know about the election between a Tea Party candidate Larry Helm running against Jayne Uerling, a progressive. Helm won with 713 votes; Uerling lost but had 629 votes. No one contested the close election and 81 uncounted ballots. 2015: At least 5 or more alternative news outlets notified Whatcom voters of the election. No wonder so many voters requested ballots. Bill McCallum, layout editor for Whatcom Watch, after waiting three months, received the above information from the King County Conservation District. He emailed me that the League of Women Voters reported that the 2011 votes of 2,295 were online votes causing many problems. In 2013 only one candidate ran. Fortunately, the Washington State Conservation group is requesting anyone having ideas for improving the voting system present their ideas by Sept 4. Do see Eller’s statement at the end of this article. Other State Conservation Districts: Washington state does not have stringent rules for how elections for the 47 different Conservation districts are held. But they do have some. There are some appointed supervisors as well as elected supervisors who must be landowners who run a farm. My! Was this the reason the election has been so hidden from voters, voters who also like to drink the county’s water and plant those ridiculous organic crops? What, candidates must be landowners? I thought that law was dissolved a couple centuries ago. But then again, the autumn 2014 new Whatcom Improvement Districts voted in five new “Whatcom Water Improvement Districts” with the assistance of Henry Bierlink, of Farm Friends and our County Prosecutor McEachran whose lawyers advised the Whatcom County Council that they had better vote for new bodies or fear being sued. Council woman Brenner and many other citizens did not like that in order to vote in these districts, landowners had to have 4.5 acres for 2 votes, 45 acres for 20 votes, and 450 votes for 200 votes. It did not matter if someone was a citizen. They just needed to own land. Thankfully, some voters were Canadian and voted “no” for the new districts. Few Whatcom citizens knew about this election either. Of course, if they did not own land, why should they? They could not vote. Why did so few citizens know about this Water Irrigation District election? Ralph Schwartz, from The Bellingham Herald, did write several clear articles. Unfortunately those articles were hidden amidst other November election concerns. Was the poor timing planned? The 2015, the WCD Helm and Monjure election was quite a headache for all concerned. Office workers said they were tired of dealing with the election and not having time for their usual important work. Even Bill Eller wants citizens to comment about another system of electing Washington Supervisory board members. Hopefully citizens will send in their recommendations. Read on. The board position is not a paid position but decisions are made that affect all of the county’s residents’ land and water. All residents of Whatcom County need to be represented. What do other states do with their many Conservation Districts that are state run and federally funded? Unfortunately, I could not find a book that presents that vast and widely diverse information. It would be a great project for a graduate student or professor. But let’s look at our progressive state to the South. Oregon has Soil and Water Conservation Districts that hold all elections with other local and national elections. Guess what? Voters come out to vote in those elections. It’s more expensive but don’t we usually get what we pay for? Christine Gregoire, Washington’s past governor, decided the Conservation District elections could be eliminated and the districts should become part of Washington’s huge Agricultural Department. Farmers did not like that because they felt no autonomy. They wanted more voice. But are farmers the only ones wanting more voice? How about the citizen residents? How about the farm workers whose lives are often endangered with pesticides and dangerous equipment. Shouldn’t they have some autonomy? It may also be wise to send it to Governor Inslee as he is ultimately responsible for the districts. Unless, of course you want to give full trust to the Washington Conservation District. If there is going to be an election for any District’s Supervisor’s position, write at least 400 words describing the election, the candidates, and voting process. Place this conspicuously in all significant news outlets as well as the district’s web site. 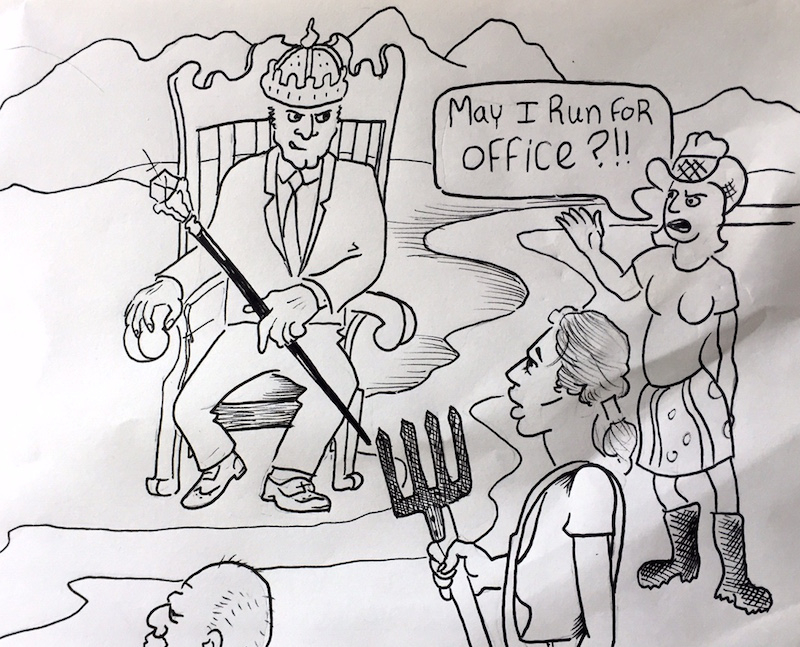 Consider having the governor and/or a representative from The Agricultural Department appoint, rather than having a limited number of voters electing some positions. Notice that of the elected representatives since 2009 to the Board of Whatcom CD, there have been only two women, both progressives, even running for an office. Both of those women lost by tiny margins. By requiring that more news outlets throughout the county report on elections, more women may run in all district elections or request being appointed. Since consumers and landowners depend upon farm workers to gather crops, there should be farm workers being represented on all District Boards. Think about it, if there are problems with pesticides, is it only the farmers who need to know? Christine Gregoire, past WA governor, suggested that all WA CDs be part of the WA Agricultural Department, but Landowners felt their voice was too nullified. Wait a minute: Whose votes are nullified now? Aren’t all citizens responsible for their districts land and water? In order to oversee what is happening, why not have our huge state Agricultural Dept. appoint a representative for each of the 47 District boards? In that way, the representative can at least oversee and report on actions of all of the Washington CDs. In order to make their duties clear, Oregon has their CD’s named: Soil and Water Conservation Commissions. Because of the name difference, the duties of the districts are clearer than just Conservation District. – Sounds like CC in Washington are hiding behind a poorly defined word – what is being conserved? Pickles? No No, that is preserved. Change the name to Soil and Water Conservation District or challenge a clearer name change. Also, Oregon has elections for their CDs during regular elections and more voters become aware of citizens’ voting choices. This election should be a part of Debbie Adelstien’s duties. Funding may be more costly but at least an election would be an election, not fraud. Have notes of any meeting presented on-line. Readers, September 4 is the deadline for submitting comments about possible changes to Mr. Eller. Feel free to use any ideas from this article. Paranoia and/or wisdom also tells me that Governor Inslee would also be good to mail comments to. [Election] Details are available at http://scc.wa.gov/elections/. … For the election and appointment policy and procedures clarifications, the due date for comments is September 4, 2015. Please use the Feedback Form to submit your comments. Upon receipt of comments from districts … The senior leadership team will then make their recommendations of the proposed final policy for the Commission’s consideration at the September Commission meeting. Read Barbara’s related and concise article, Whatcom Conservation District Elections, on NorthwestCitizen here. This entry was posted in Commentary, Data, Information and tagged Bill Eller, David McEachran, election fraud, Henry Bierlink, SCC, Voting protocol, Washington Consevation District, Washington State Conservation Commission. Bookmark the permalink.